RuneAudio is a free and open source Linux distro. Based on Arch Linux, the RuneOS transforms embedded systems (e.g. Raspberry Pi, BeagleBone Black, CuBox, UDOO, Cubietruck, ODROID) into a Hi-Fi digital music player. Users can control playback and system settings by via web interface - RuneUI which accessible from devices like computers, laptops, smartphones and tablets. 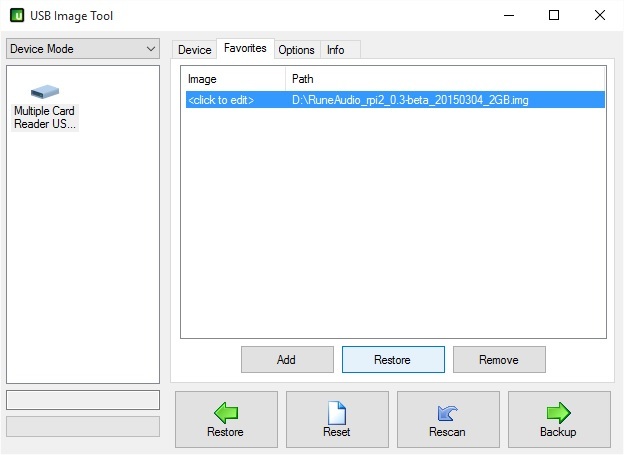 Download the RuneAudio image for Raspberry Pi 2 then extract the .gz file with 7-Zip. Downlaod and extract all the files in USB Image Tool archive. Insert your MicroSD card into card reader and open USB Image Tool. On top left, choose Device Mode and then select your MicroSD card drive. Click Favorites tab, then add the RuneAudio image file. Ensure you have correctly selected the drive of your MicroSD card. Click Restore button and wait until the write is complete. When the writing process is completed, safely eject the MicroSD card and slot it into Raspberry Pi. Now we move on to the Raspberry Pi hardware setup. Plug in PSU, Speaker's analog jack, network ethernet connector or USB wireless adapter (Ethernet connection is required on first use to setup wireless network) to the Raspberry Pi. Turn on the power of Raspberry Pi. You may skip this step if want to use wired connection only. Click Menu > Network, connect the wireless network to your router so that you can directly use WLAN connection next time without the need to plug LAN connector. Click Library tab and configure your source of music files. Add them to queue as playlist and enjoy your music. The source of music supports local network devices, USB flash drive, Spotify and webradios. This program looks pretty cool to me. Thank you posting the instructions on how to set it up and the link for download. I’d appreciate if you could post a review too.